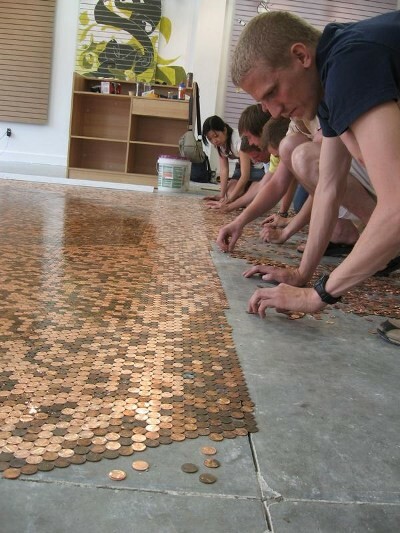 The smile inducing “how much does it cost?” is a great place to start. Flashy animations are all the rage on cable news networks. And people love infographics. 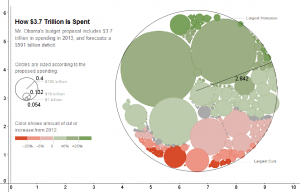 Both show a illogical love for graphs made out of circles. 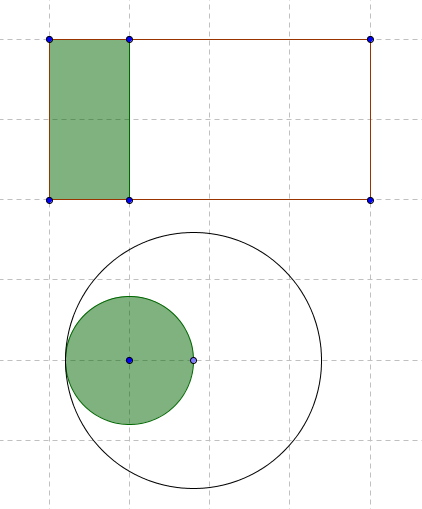 radii measured with geogebra after constructing a circle through three points plotted on the edges of the graphics circles. There are two issues: squared ratios, and packing. The first arises that as you change the radius of the circle, the area will increase by the square of the radius. So the designer has to choose one measurement to represent their unit. It appears that they chose area for this graph. The given scale seems accurate for the $100 billion circle’s area to the $10 billion circle’s area. 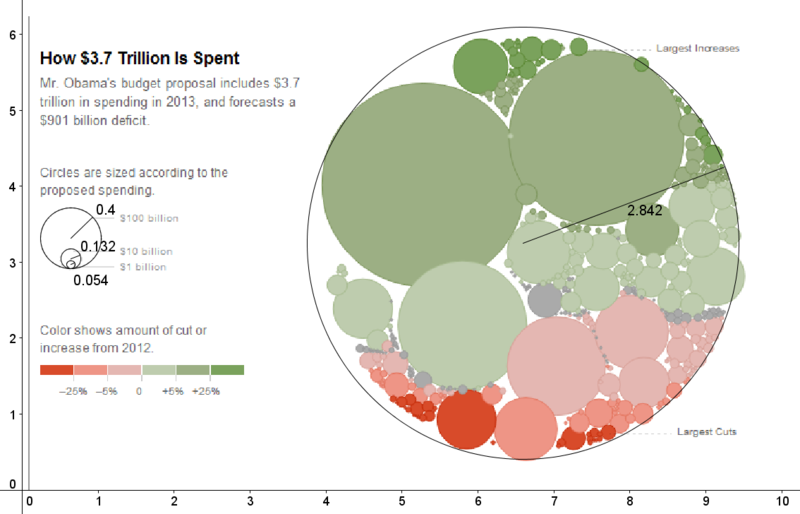 However, the $1 billion circle appears to be off, or I can’t measure it precisely enough. The problem here is that we are better at recognizing linear relationships rather than square relationships. The problem here is human intuition. Does the largest circle look like 10 times as large as the medium one? Consider these two representations of an area growing by a factor of 4. Which is more natural? That is the second issue: packing. Rectangles are easy to pack. Copy that green rectangle 3 more times and it will fit exactly in the area outlined. But to fit the circle into its large circle of 4x the area, it requires distortions. Those distortions harm the communication of knowledge. Back in the first image, they attempt to pack a lot of various budget area’d circles in a large circle. But the empty space makes the budget cover an area much larger than it should. Infographics should always aim to present data in a way that makes it easier for the public to understand. When style is chosen over substance, the information is distorted, literally. Because of the competing effects of being too large or too small, I don’t believe the mis-communication was malicious. Rather, it was ignorant. Dan Meyer has morphed his “What can you do with this” edu-meme into “#101qs”: what questions pop into your head upon observing a picture, movie, or other demonstration. The more likely it is that a student will ask that question, the better. If you tossed that up in your class, what would the kids say? What’s the first question that pops into your head? I’ll offer my own thoughts, and I welcome you to share yours in the comments. I think this image has a lot of things going for it. It is clearly the ACT1 image. Toss it up. Don’t say anything. What will the kids ask? What do you mean you don’t know!? you’re the teacher! Alternatively, you could say 5 feet by 2.5 feet on the image. Or if you’re really brave, you could estimate it by the heights of the kids in the screenshot. Ideally, you don’t have to say much else. To a stuck student I might offer only: “unfold it“. How many rolls did they buy? What did it cost them? How thick is the paper? Graph THAT. How many layers are at the 13th fold? Another graph to make! What is preventing the 14th fold? Why did they stop? Ah, but there’s a bonus: we have the actual video of them doing the folds. What a great way to end the class! Credit to Dr. James Tanton http://www.jamestanton.com/ for leading the actual exercise at MIT. I put it up in my small 6th period class to get a taste for how things would go. Students immediately related to it (one kid correctly named the BART station) With a little prodding — “did you see the guy with the bike who was bookin’ it?” — they talked about how fast people were going. Then they talked about trying to go down an escalator going up or up and escalator going down. We didn’t get to any sort of problem solving, but we did count that it took about 30 seconds to merely ride the escalator up. More on this as it develops… especially if I have time to implement it fully. The Holt Geometry book starts every section with some “real world” application of the topic.